In a Google+ status update, YouTube Product Manager Brian Glick revealed that you can now watch videos on YouTube in real-time with your friends via Google+ Hangout. 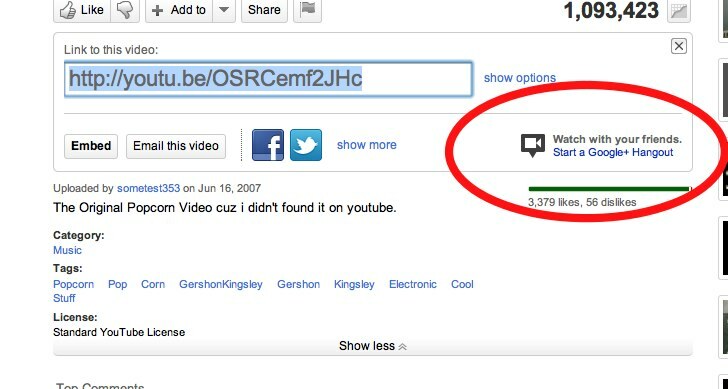 It works like this: Hit the “Share” button under any video on YouTube, then click the “Watch with your friends: Start a Google+ Hangout” link that appears at the bottom right of your YouTube toolbar and it will automatically link up with your Google+ profile. From here, you can select who you’d like to invite to your Hangout and proceed with the viewing alongside your gathered audience. In a previous incarnation of this same feature, those of us using Google+ Hangouts will have noticed that sharing a video directly into a Hangout was once the only way to view YouTube videos with our Circles. It appears that Google is now clearly making an effort to merge Google+ across their core products. With YouTube being a huge success in terms of traffic and usage, being able to view videos in real-time with friends directly through the YouTube platform seems like an excellent way to loop new adopters into the Google+ project.